Quintessential has fully leased its Woden office building after a major upgrade. Property fund manager Quintessential Equity has struck a massive 11,000-square-metre leasing deal with ACT Health for a Woden office building in Canberra. 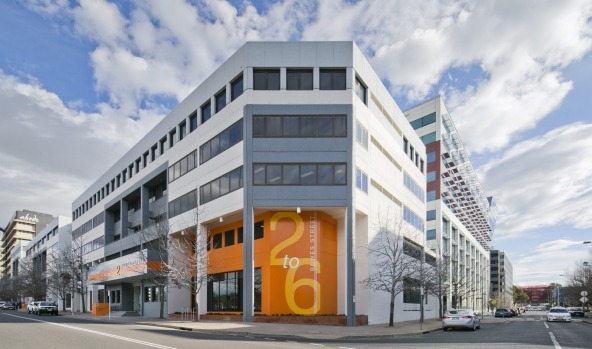 The Melbourne-based boutique investor recently refurbished the 2-6 Bowes Street building, eight kilometres south of the Canberra CBD. It will become the new home of ACT Health and 750 of its workforce, who are relocating from several sites around Canberra. The ACT government agency has signed on for 15-year tenancy across nearly 90 per cent of the building. With the latest lease deal, combined with existing tenants – the Commonwealth government and Employment Plus – the once-vacant building is now fully leased. Leasing agents for the Woden building were Colliers International and Raine & Horne Commercial Canberra. Quintessential bought the property for $14 million in June 2012. Two years ago its new owner took the asset through a nine-month regeneration program to achieve a 5-Star NABERS base building energy rating. The upgrade transformed the building with new lifts, services and refurbished amenities, while cutting its energy costs. Quintessential’s chief operational officer, Russell Bullen. said the new tenant would consolidate Woden’s reputation as a hub for heath administration in the capital. Quintessential has been an active player in Canberra in recent years, acquiring and working up several properties. Last year it purchased an office building in Forrest from 360 Capital for $32 million. At the time, the acquisition was third in the Canberra market within 12 months. Established in mid-2010, Quintessential has been busy in other markets as well, including Geelong, Victoria’s second-biggest city, where it has several projects in hand. The $120 million building it is developing in Geelong for WorkSafe at One Malop Street won the backing of the Clean Energy Finance Corporation, which will provide all the senior debt. Also in Geelong, Quintessential is pursuing a proposal to house the new $120 million National Disability Insurance Agency headquarters.